Dinner was had last night at Hill Country, which is a really fun (though mildly annoying) place to grab BBQ, tasty sides, whiskey drinks and Big Red. We were too full to consume any sweets, but I was eyeing them anyways with thoughts of today. 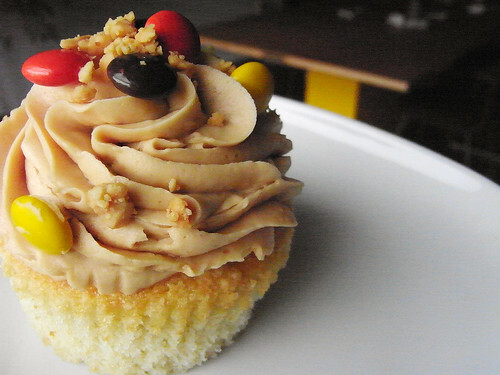 This PB&J cupcake was chosen over the pecan pie, solely for it's photogenic looks. While we're sure there are many fans of this out there, it was a tad sweet for our tastes, though still rather enjoyable. I have been homesick for cupcakes recently! When I'm home for Christmas I might just have to try this- even if it is too sweet.